A value-engineered and highly efficient steel-framed sports hub will help the University of Warwick achieve its ambitious physical activity targets. Due to complete in March 2019, the University of Warwick’s new sports hub will create one of the foremost sports facilities at a UK university – including what is claimed to be the country’s largest gym facility in the higher education sector. The project aligns with the University’s ambition to be the “most physically active campus community in the UK by 2020”. Replacing the current sports centre on the campus, the hub will feature a 16-court sports hall, a 25m-long swimming pool with a moveable floor, fitness suites, climbing and bouldering walls and flexible studio spaces, as well as squash courts, outdoor 3G sports pitches and netball courts. It will also be the official training ground of Coventry’s Wasps Netball Superleague team. Another benefit resulting from this design change was a quicker steel erection programme. Including the metal decking installation and the remaining precast planks, the work was completed in 13 weeks instead of the previously estimated 18 weeks. Overall the sports hub is one large steel frame, which gains its stability from strategically-placed cross bracing, and offers 14,000m2 of floor space. Two large open-plan areas dominate the building and are placed at either end of the 200m-long structure. At the northern end of the structure the 16-court sports hall is a large column-free space reaching the full-height of the building. The hall is formed with a series of 11 spliced 40m-long × 2m-deep trusses, which weighed 8t each. Another design innovation from Hambleton is a series of beams that cantilever out from the top of the sports hall’s roof and over the lower roof of the adjoining areas. Willmott Dixon supported the scaffold for the cladding installation on these sacrificial beams, which will be removed once the cladding is complete. “This helped speed up the installation of the scaffolding as it would have ordinarily been supported from ground level. By using the beams, the scaffold was erected more rapidly, which allowed us to get started on the cladding earlier, and meant we got the sports hall watertight earlier,” says Mr Preedy. At the southern end of the hub there is an 8m-high swimming pool hall, which is another large open column-free space. This zone is formed by a series of 30m-long glulam beams supported on steel columns. The columns in the pool area will be left exposed in the completed building, as will most of the sports hub’s steel frame. 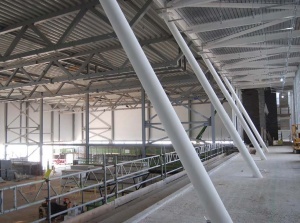 To this end, all of the project’s steelwork has been painted with a high-spec protective coating to prevent any corrosion from the potentially humid and chlorinated conditions. The sports hub’s other facilities occupy the large area between these two column-free zones, as well as running along the entire eastern elevation. In these parts, the hub has three floors, a basement – mainly accommodating changing rooms and offices, a ground floor with the main entrance, climbing wall and squash courts, wet changing facilities and a café, and a first floor containing a 330-station gym and multi-purpose studios. Steel starts at basement level, where a large concrete retaining wall forms this partially subterranean level. Early in the construction programme Willmott Dixon completed a cut and fill operation, removing 20,000m3 of overburden to level the previously sloping site. As well as internal exposed steelwork, some of the hub’s exterior steel will also be remain visible as architectural features. Adjacent to the pool hall a large cantilevering canopy, partially supported by raking CHS columns, creates an outdoor terrace for the hub’s café. At the opposite end of the hub, a similar canopy forms the roof for the facility’s main entrance, again supported by raking columns. These raking 273mm-diameter columns also extend along the exterior of the eastern elevation, joining the two canopies with a series of large Ws, which obviously stand for Warwick. Most of these raking columns are not structural, but purely architectural. They are attached to the elevation’s cantilevering roof and will be installed once the cladding is complete. 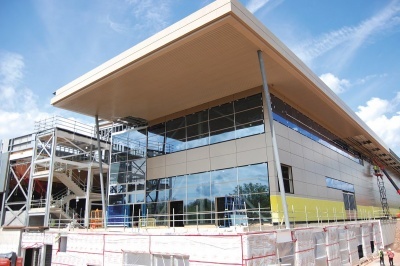 Summing up, Willmott Dixon Managing Director in the Midlands Peter Owen says: “This is a fantastic project to be part of, creating cutting edge sporting facilities for the community at University of Warwick, which will really benefit its users.”.